I don’t understand how people eat plain waffles without syrup. Blueberry and chocolate waffles without syrup are fine – but plain? I can’t do it. It just doesn’t make any sense. I actually have been able to do it. Substitute honey or a type of jam or sometimes just butter can do it for me but that’s a stretch. My dad puts orange juice on his waffles and pancakes but I find that gross. Ham or bologna and American cheese! Try it! The cheese gets all melted. Yum. oh gosh this is too true. great! suggestion: lose the text. we get the idea without it. You’ve obviously never been hungry enough. Or had the munchies. I’ll have to try this. I believe that your method can maybe, just maybe, be further improved by replacing the plain waffle with the chocolate chip waffle. put peanut butter on it!..as soon as it comes out of the toaster. then the peanut butter melts and seeps down into all the holes and becomes heaven. also: drizzle honey on top of that. I haven’t put syrup on toaster waffles since I tried this. maaan this reminded me of roscoes chikin and wafles bac in south central it was real fire, i couldnt get enough of syrub!!!! I believe this falls into the category of first world problems. I make Belgian waffles from scratch and you can eat ’em right off the griddle with nothin’. That said, jelly on waffles rocks the entire planet. 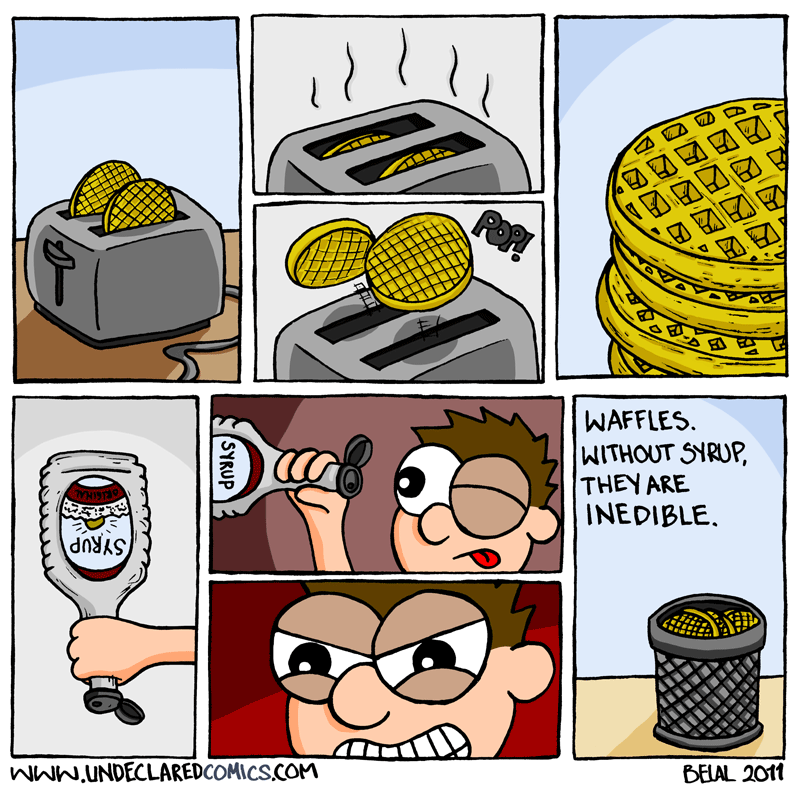 Im not a big fan of butter on my waffles. Im down with cinnamon – its delicious. …. if you run out of syrup, put a scoop of icecream on it…. maybe some fresh fruit….